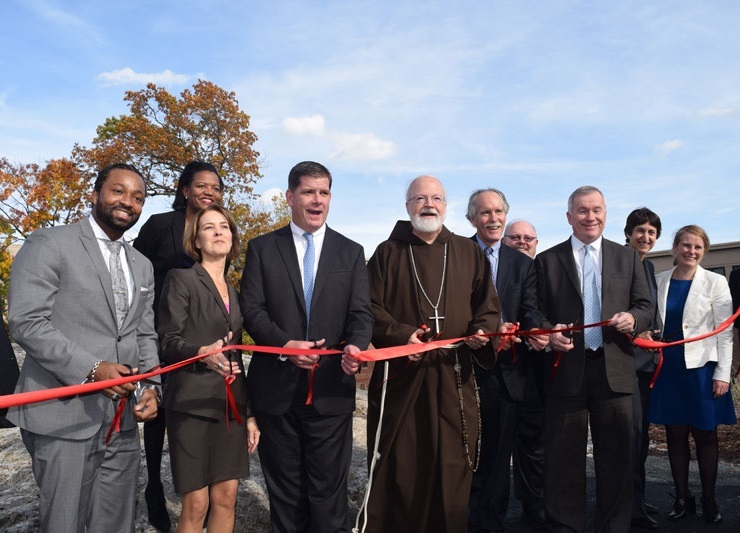 Mayor Walsh, Cardinal Sean O’Malley and others celebrate the opening of Uphams Crossing in November 2015. 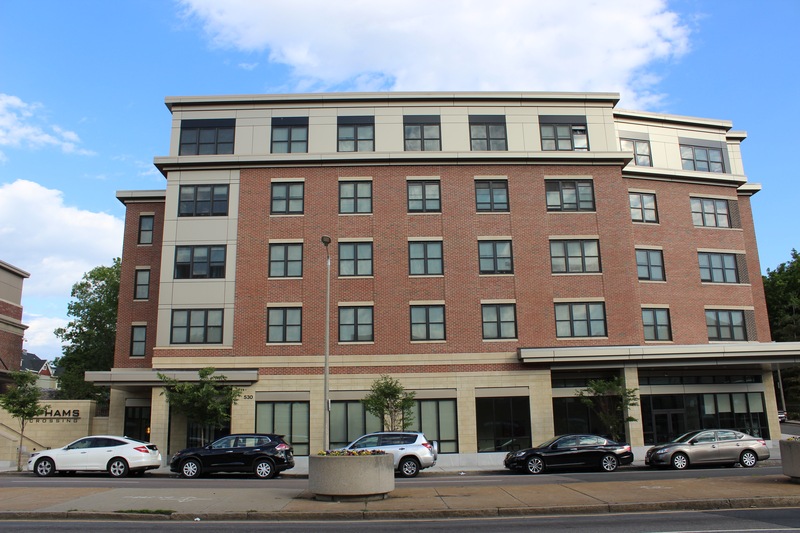 At its ribbon-cutting last fall, the Uphams Crossing residential complex was hailed for transforming the site of the long-shuttered St. Kevin’s School into 80 units of much-needed affordable housing. But the success of the St. Kevin’s redevelopment extends well beyond the lives of its new residents. The building itself – each brick, pane of glass, and coat of paint – is testament to another good, the value of equitable work. Of the workers involved in the renovation and construction at the St. Kevin’s site, 45 percent were Boston residents, 50 percent were people of color, and 6 percent were women (double the national average for female employment in the construction industry). Established in 1983, the Boston Residents Jobs Policy (BRJP) requires contractors on all city-assisted construction to make “best faith” efforts toward employing at least 50 percent Boston residents, 25 percent people of color and 10 percent women. (These BRJP goals are commonly referred to as 50-25-10). Historically, though, these goals have been spottily realized. By the time Mayor Walsh arrived in office in 2014, the average percentages of resident, minority, and woman workers on city projects hovered around 30-31-4. The following year, Walsh told the Boston Globe that the city was increasing funding for BRJP compliance inspectors. “As we move forward down the road, we’re going to be looking to add more enforcement,” he said. Before construction began at the St. Kevin’s site, the city’s BRJP Office met with the site’s owner and developer, Planning Office for Urban Affairs (POUA), an affiliate of the Archdiocese of Boston, to review steps for establishing progress toward the BRJP’s 50-25-10 goal. POUA not only committed to best faith efforts toward reaching those goals, filing bi-weekly reports with the agency, but also met with the local community to set its sights even higher. In partnership with the Dudley Streets Neighborhood Initiative, the POUA aimed for 51-51-15. “We made the hiring goals of 51-51-15 part of the bidding package to our general contractors, so they knew prior to bidding that they would be held to a high standard,” Lois Alksninis, a POUA spokesperson, wrote in an e-mail. Meanwhile, Bilt-Rite Construction, the general contractor ultimately chosen for the project, was preparing for those goals, too. Uphams Crossing on the former site of St. Kevin’s School in Dorchester. During construction, Bilt-Rite helped subcontractors with their BRJP paperwork, pre-paid their invoices while awaiting project funding, and communicated clear expectations for hiring goals. With one exception, he added. Minority-owned businesses, he said, tend to do a better job of meeting hiring goals. “A lot of times, they’re doing business right out of Roxbury or Dorchester. Their workforce is right from the area,” Sullivan said. Rise & Shine Cleaning is one of those businesses. Founded 15 years ago by Lois Reason, an African-American woman and veteran, the company did construction and post-construction clean-up for the St. Kevin’s development. Did she find the project’s hiring goals a challenge? Consequently, Reason said, she can easily find workers from the neighborhood and through her company’s referral service. Sharif Shӓrif, an African-American Dorchester resident, was one of the Rise & Shine workers employed on the St. Kevin’s project. His work cleaning windows and doing communications for the company represented no small achievement. Shӓrif had long battled drug-addiction and spent some 20 years incarcerated. Upon release, he graduated from a paralegal program and found employment with Rise & Shine, which he credits with employing people who need a fresh start. “They can get experience, establish themselves, and better their lives,” he said. As someone managing disabilities ranging from OCD to PTSD, he appreciates the flexibility of the construction industry’s project-by-project workflow. And he appreciates the BRJP. The Greater Boston American Apprenticeship Initiative is one city-led effort to do just that, training low-income, minority and female residents for work in construction. Administered by the Mayor’s Office of Workforce Development, the five-year initiative funds the pre-apprenticeship programs Building Pathways and YouthBuild Boston, which provide participants with job readiness skills, exposure to various trades, and opportunities to earn industry certifications. Upon entering union apprenticeships, participants earn starting wages of $19 per hour and can work toward journeyman wages starting at $35 per hour. Simultaneously, they can work toward an associate’s degree at Wentworth Institute of Technology at reduced cost.